It looks like Microsoft continues its advertising campaign. 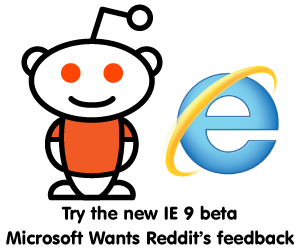 This time, company asked Reddit users for the Internet Explorer 9 feedback. 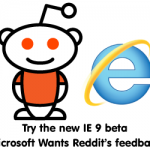 If you have Reddit account already and want to provide some constructive criticism, head over to the following page and share your IE9 experience. The installation took way too much time for a browser. That blank space over the tabs is useless. Search field and tabs should not be on the same row. i persisted and installed this damn thing, but i CANNOT see any non-tech relative of myself going around the net downloading dependancies for this stupid thing when each and every other browser installs from ONE file and does NOT require reboot/install addons etc..
and mine didnt install.it just failed during update.is it due to ie8 still installed in my pc or due to my OS being non-genuine?dunno what to do. It asked for updates and then failed to install updates (that you downloaded manually)? the automatic update while installing failed and it prompted me to download updates manually which i couldnt do.any MS site,downloading just doesn’t work for me.it says page cannot be displayed and check ur connection…i tried it after disabling firewall and it still wouldnt download….maybe due to my pirated os. I see, different issue than mine, oh well, maybe they will fix that in the upcoming IE9 build. WTF beta install over stable version without asking. I have Win7 x64(Original Activated), it installs fine with out any problem. So far it is working fine for me.